This 1890s historical building has been converted into one of the area’s most elegant and comfortable places for nightly, weekly or monthly lodging. Award winner for historical restoration, Absaroka Guest House vacation rental provides a delightful blend of the charming past and modern style. It truly is one of the best for Livingston lodging. A few blocks from art galleries, coffee shops, dining, outfitters and shopping, Absaroka Guest House resides near the heart of downtown Livingston, while maintaining stand alone peace and quiet. Guests can also easily walk to the Yellowstone River and Sacajawea Park. Yellowstone National Park, the Paradise Valley, Bridger Bowl Ski Area and Bozeman are all in the immediate vicinity. This unique rental has two stories plus a “wine room” den. 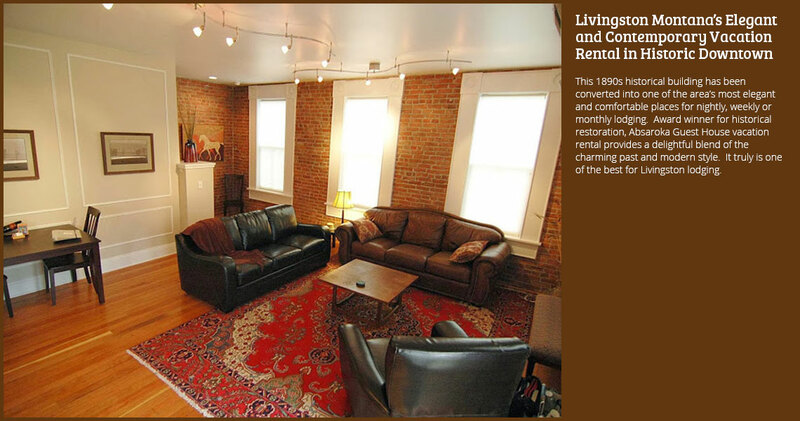 With original wood floors and brick and stone walls, Absaroka Guest House is spacious and luxurious. It sleeps five comfortably, though with space for more. Additional information about rooms and amenities may be found here. Absaroka Guest House | Places to Stay All rights reserved.